It’s just hours away from April, which, of course, is National Poetry Month. Betsy is our resident poet, which you know if you followed her writing during our March Slice of Life Story Challenge. Not only does Betsy teach her youngsters to express their innermost thoughts through this intriguing genre, she also writes stunning poetry herself. Check out this recent Slice as a case in point. So, needless to say Betsy will be posting some poetry gems very soon. Because Betsy will give us a lot of great ideas on how to support poetry writing, I thought I’d kick off the month with some thoughts about a possible way to begin and a possible way to end a month of writing poetry. My friends and colleagues Jody Quam and Katie Hunt are launching poetry in their multi-age Lower Elementary Montessori classroom. They are following the Teachers College Reading and Writing Project’s writing curriculum, and so began their poetry unit with immersion. 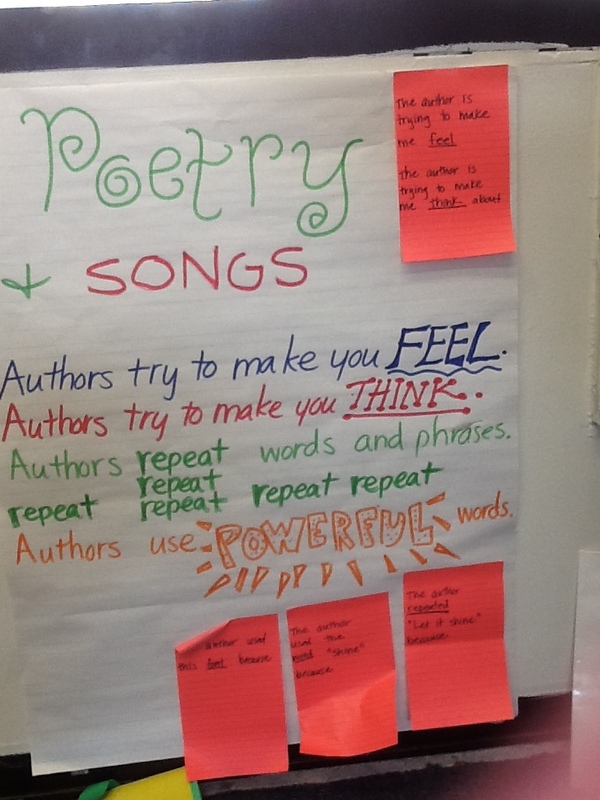 They not only immersed their budding poets in a lot of great poetry, they helped their poets get to work right at the start thinking about meaning. Jody, who is teaching the first graders for this unit, began with a bit of instruction. She told her students that poets try to make you feel something and think something. Then, she asked them to study a whole bunch of poems, many of which would become writing mentors for the unit, and to think about what the author was really trying to say. This simple yet powerful bit of instruction set the stage for her poets to move away from “roses are red, violets are blue” types of verses and to begin creating meaningful, personal poetry right away. Starting with meaning right away supports that all-important reading and writing skill: interpretation. Certainly, writers are readers, and as readers, they must be able to assign meaning to what they read so that when they write, they can think: What am I really trying to say with this piece of writing? What a valuable, life-long lesson to teach through poetry. Writer Vivian Paley has said, “Poetry is the school I attended to learn to write prose.” Indeed, poetry is a genre that exemplifies simplicity and focus. When writing poetry, every word, every comma, every line break matters. Only what needs to be said is said. I once took a writing course with James Howe. In the course, he asked us to write down what we would take with us if we were moving to a desert island. We were allowed to bring all that we needed for sustenance, security, basic comfort, and those things which bring meaning to our lives. Nothing more. As an aside, I recommend trying this exercise yourself or with your students as a way to think about what poetry really is. Because then, James asked us to consider a piece of prose we had written, and to delete all but what was needed for clarity and meaning. My friend and I were walking in the park. It was a hazy day and the sun was just starting to burn off the clouds. I hadn’t seen my friend in a while. She started to tell me a crazy story about her mom and how her mom was losing her memory. She said at first her mom couldn’t remember little things, like where her phone was, but those things started to morph into bigger things, like her mom losing her passport when she was traveling. My friend was very worried. And of course her mom is scared. They don’t know where to go next. My friend and I were walking in the park. It was a hazy day and the sun was just starting to burn off the clouds. I hadn’t seen my friend in a while. She started to tell me a crazy story about her mom and how her mom was losing her memory. She said at first her mom couldn’t remember little things, like where her phone was, but those things started to morph into bigger things, like her mom losing her passport when she was traveling. My friend was very worried. And of course her mom is scared. And I would feel exactly the same. They don’t know where to go next. So what lesson did poetry teach prose? Although I might not choose to publish this piece as a poem, stripping it down into all but the essential in order to form a poem becomes a powerful revision move. I can see places where I was editorializing, where some of the original details don’t really add meaning and aren’t necessary to the piece of writing. When moving from a poetry unit to a different writing unit, one might remind writers to consider what is needed for clarity and meaning, and to strip away the inessential. Happy Poetry Month! We invite you to share some of the poetry you and your students are writing in the comments sections of our posts. Oh good! Would love to know how it goes. I love the idea of stripping things down. Makes me realize what I really meant. What things hide in between all of the extra unnecessary items. So true! So often the real meaning gets bogged down. Or, we don’t know what it is ourselves until we try to strip away the inessential. There is so much I am taking away from this post, Anna. Thank you! I have to start another round of revisions with my picture book since I’m getting ready to send it around to a few people (not agents yet!). I will try out Howe’s advice. Stripping away for clarity and meaning might help me get my word count down. James Howe is brilliant! It’s so exciting that you are that far along in your manuscript. Happy Poetry Month, Anna! I love your suggestion to strip away all but the essentials of a piece of writing as a revision tool. So smart! It’s been such an amazing unit so far! I can’t wait to see what the kids show next! There are so many wonderful poems from your class already – it was hard to choose just one! You are making me think about so many possibilities for poetry to inform prose and vice versa, Betsy. Mining past writing for poem ideas would be great too. And yes, Jody’s chart is awesome. I should say – her CHARTS because they always are. I hope to post more!